So I picked up a refurbished Pebble Time watch from Woot a few weeks ago. Having owned a Moto 360 I can say this is a much nicer watch for me. 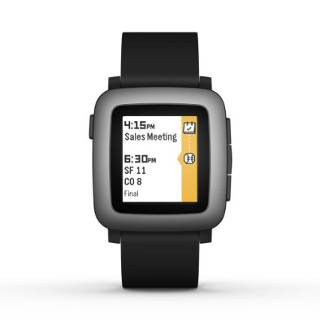 Pebble watches are not OS specific so it works great with my iPhone. The screen is always on with variable back light depending on ambient sensor. Battery life is 4 or 5 days easy. Its lighter and smaller than the 360. I prefer a leather band so might have to upgrade at some point but the included silicon one is very comfortable. Screen resolution is much lower than other smart watches so the faces are not nearly as fancy. I did find a very nice LCARS theme I use as my daily. The included phone software is super easy to work with. As notifications to your phone happen the software adds them to a list. At this point you can then decide if you want to forward them to the phone or not. Very slick. Also, if you dismiss anything on the watch it does not mark it read on the phone. This works great for me as I would always forget to go back and check old notifications with the 360. After a week of use I would not hesitate to recommended the Pebble watch to anyone needing simple notifications but not native apps.